From collecting and transmitting observation data to delivering customized products to end-users, MFI's system offer covers the complete meteorological dataflow and responds to all the needs of a National Weather Service or any other weather-sensitive entities. "State-of-the-art systems developed by meteorologists for meteorologists"
Our systems are meant to work together in a coherent and integrated meteorological ecosystem, but they can also be acquired separately to fulfill one specific need. 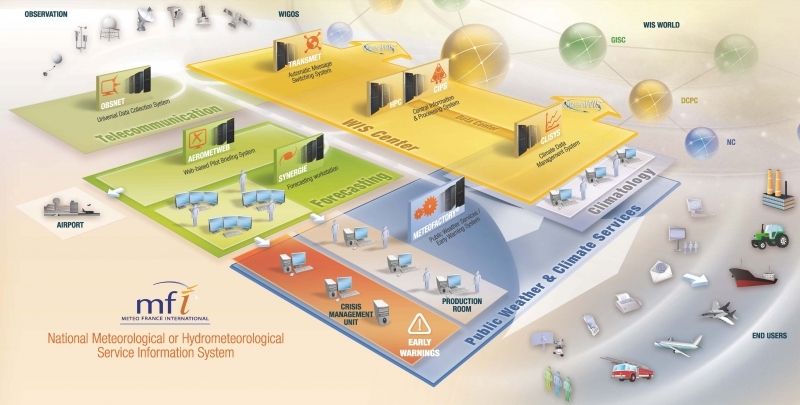 The following illustration represents the ideal functioning of a National Meteorological Service and how MFI's systems interact in order to provide a smooth and reliable data workflow from observation to customized products for end-users. -	Telecommunications (TRANSMET AMSS, OBSMET DCS). -	Forecasting (SYNERGIE-WEB Forecasting System, AEROMET-WEB Pilot Briefing). -	Data center (CLISYS CDMS, CIPS Central Information and Processing System). -	Public Weather & Climate Services (METEOFACTORY® PWS / EWS, VISUMET Public Display, TVMET). Innovation is a value we cherish at MFI. We have our own development team and we dedicate more than 10% of our annual revenue to finance research & development programs. Our systems are mainly derived from Météo-France's information systems and solutions, designed to be used daily by their meteorologists and fulfill all their operational needs. MFI's systems are the result of an efficient co-development by its own software engineers working in close collaboration with Météo-France's experts, ensuring that our systems are as relevant as possible for all professionals of the meteorology world. Of course, we also bring a special attention on adapting our solution to requirements and specificities of our international customers.